While it will hardly come as a surprise to anyone following the ongoing additions to Trump's cabinet, one can now effectively cross off "draining the swamp" from the list of Trump's stated intentions. "I'm told he now just disclaims that. He now says it was cute, but he doesn't want to use it anymore," Gingrich said, and also predicted there would be "constant fighting" over Trump's efforts to reduce the influence of lobbyists and Washington insiders. “But, you know, he is my leader, and if he decides to drop the swamp and the alligator I will drop the swamp and the alligator,” he said. Gingrich, who has been a close adviser to Trump, said he likes "drain the swamp" because it “vividly illustrates the problem, because all people in this city who are the alligators are going to hate the swamp being drained.” It also vividly illustrates why draining the swamp is virtually impossible when even the candidate who runs on such a promise promptly backs away from it once elected. Meanwhile, according to AP, Trump's aides denied and said the president-elect remains committed to his underlying swamp-draining policies, albeit in a lite version, such as banning outgoing Trump transition and administration members from lobbying for five years. Trump also prohibits any lobbyists from joining his transition team or administration unless they de-register. "President-elect Trump's ethics reform policies are full speed ahead," transition spokesman Jason Miller said. "We're going to change the way business is done in Washington and start putting the American people first." To be sure, for some, like Ray Dalio, putting mostly business executives and billionaires "first" is a good sign. Others are yet to be convinced. "'Drain the swamp'" became a staple of the final month of Trump's campaign, with crowds chanting it as loudly as they had been shouting "build the wall" and "lock her up." The slogan also appeared on T-shirts and signs. It has remained part of Trump's post-election "thank you" tour. Whether in Ohio or Florida, the crowd continued to shout along with the president-elect as he vowed to curtail corruption in Washington — even as he revealed that he wasn't always crazy about the catchphrase. "Funny how that term caught on, isn't it?" Trump mused during a rally this month in Des Moines, Iowa. "I tell everyone, I hated it. Somebody said 'drain the swamp' and I said, 'Oh, that is so hokey. That is so terrible.'" "I said, all right, I'll try it," Trump continued. "So like a month ago I said 'drain the swamp' and the place went crazy. And I said 'Whoa, what's this?' Then I said it again. And then I start saying it like I meant it, right? And then I started to love it, and the place loved it. 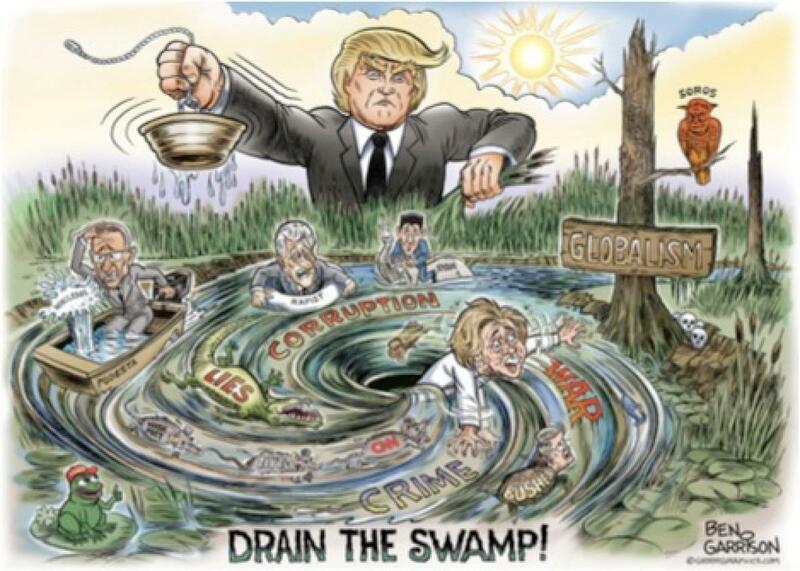 Drain the swamp. It's true. It's true. 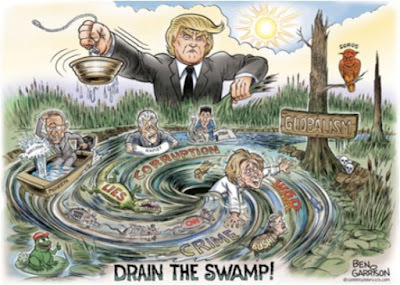 Drain the swamp." A seemingly resigned Gingrich told NPR that as the incoming president, perhaps Trump feels that "he should be marginally more dignified" than leading crowds in "lock her up" and "drain the swamp" chants. Gingrich said he supports Trump's ethics reform proposals. Meanwhile, a far angrier Mike Krieger lashed out, saying "Not that he ever wanted to, but here’s Newt Gingrich admitting what many of us already knew regarding Donald Trump’s fake populism." Penalties don’t’t change the behavior of white collar criminals. Jail sentences would, but we don’t see any of that when it comes to bank execs. Thanks for playin’ America. Well, if Krieger is right and Trump has indeed outsourced the management of the US economy to Goldman, the silver lining is that the inevitable systemic reset will simply come that much faster.